MR Online | The Latin American left’s setbacks: what does it all mean? Posted Apr 17, 2019 by Eds. Ellner: The detractors of the Pink Tide phenomenon imply or explicitly state that it will soon become a thing of the past without any long-lasting effect. The view is underpinned by the “dinosaur” narrative and the “end of history” thesis of Francis Fukuyama, along with the rights’ standard argument that socialism and the policies associated with it will end up in the dustbin of history. These writers and political activists, however, ignore that socialism has really not been put to the test because none of the Pink Tide countries have been socialist. Eighty percent of the Venezuelan economy, for instance, is owned by the private sector. Some of the same analysts use the pendulum metaphor. The implication is that politics in the region is characterized by a cyclical pattern in which nothing really changes over time, even while governments alternate between left and right leaderships. (1) The pendulum metaphor, however, goes counter to the theory of “post-hegemonic regionalism” in Latin America that views the Pink Tide as initiating a new phase that displaces U.S. hegemony based on neoliberalism. These writers add, however, that the Pink Tide has not given rise to a single well-defined model. (2) Although the theory was formulated at the peak of the Pink Tide, its defenders continue to argue for its ongoing relevance in the region. Freeman: So not all analysts have waved goodbye to the Pink Tide phenomenon. What are the possibilities that it will have a long-lasting impact? Ellner: There are several indications based on past performance that the Pink Tide phenomenon will persist in time. It’s important to note that Pink Tide countries have had more staying power and that there was a greater degree of unity and solidarity among them than was the case with progressive and democratic waves in Latin America in the past. An example is the emergence of progressive governments around the time of the end of World War II in Guatemala, Argentina and elsewhere. The list of Pink Tide countries is much longer: Venezuela, Brazil, Uruguay, Argentina, Bolivia, Ecuador, Nicaragua, El Salvador, Honduras and Paraguay. And with the election of Andrés Manuel López Obrador, Mexico may be added to the list. In addition, Pink Tide leaders generally retained power for relatively long periods of time. Pink Tide governments were instrumental in the formation and consolidation of a number of regional organizations. These included UNASUR, CELAC, ALBA, and MERCOSUR, all of which promoted Latin American unity and integration. Pink Tide leaders played a key role in support of nations facing situations of political crisis, specifically Venezuela in 2002-2003 and 2017-2018, Bolivia in 2006 and 2009, and Ecuador in 2010. This sense of unity is particularly striking because the Pink Tide took in the moderate left represented by the Lula government in Brazil and the more hard-line left represented by Chávez, which historically have not always had friendly relations. The future prospects of the Pink Tide movement also has to be considered in the context of the historical decline of the traditional political party system in much of Latin America and the failure of emerging pro-establishment political elites to fill the resultant gap. During the Pink Tide period, pro-establishment parties that had been major fixtures in their nation’s political system over a period of many decades became shadows of their former selves. This is the case with the Radical Party in Argentina, the Partido Colorado in Uruguay, COPEI in Venezuela, the MNR in Bolivia, Chile’s Christian Democratic party, and the Conservative and Liberal Parties in Colombia. At the same time, the approval rating of anti-Pink Tide presidents have been extremely low, sinking below the 20 percent mark in the case of Juan Manuel Santos in Colombia, Enrique Peña Nieto in Mexico, and Pedro Pablo Kuczynski in Peru. That’s not to even mention the case of Brazil’s Michel Temer which fluctuated between 3 and 4 per cent. The discredit of major adversaries of Pink Tide movements enhances the possibility of their eventual recovery. Freeman: What about the rise of rightist governments throughout the region, and throughout the world for that matter? Doesn’t that threaten the prospects of the Pink Tide, at least in the short run? Ellner: Yes, but in other aspects, international factors favor the prospects for the survival of Pink Tide movements. Pink Tide governments strengthened ties with two global powerhouses, namely China and Russia, while the influence of the United States, which put up resistance to progressive Latin American governments, waned. U.S. economic ties with Latin America declined as did its prestige, which plummeted under President Trump. Pink Tide governments have had closer relations with Russia and China and more strained relations with the U.S. than have conservative and rightist ones. This is certainly the case with Argentina and Brazil and will be even more so in the case of Brazil’s recently elected Jair Bolsonaro. Lula’s avid support for the BRICS grouping (taking in Brazil, Russia, China, India and South Africa) contrasts with Temer’s lukewarm attitude toward the same bloc and Bolsonaro’s hostile remarks about China. Freeman: What can you say about the critics of Pink Tide governments who are on the left. There seems to be a growing number of them, or else they have become more vocal in recent years, or perhaps both. Ellner: Scholars of the Pink Tide phenomenon who criticize it from a leftist perspective tend to center their discussion on the nation’s continued or even increased dependence on the export of primary commodities, such as petroleum in the case of Venezuela and soybeans in the case of Argentina. The model they criticize is referred to as “neo-extractivism.” Their basic argument is that Pink Tide governments have failed to alter the position of their nation in the global economy and its dependency status. (3) For sure, their criticism of Pink Tide governments for failing to implement effective strategies to break dependency on primary commodities through the stimulation of local production and diversification is well taken. Unfortunately. Global capitalism based on the multinationals–that is, the monopolies at the international level–has proved to be more tenacious and all-encompassing than in the period prior to the age of globalization that set in in the 1980s. The Pink Tide governments have been unable to break this structural hold. However, by grounding their analysis on economic structures tied to the global economy, the neo-extractivism writers downplay other key factors. For many of them, extractivism is the point of departure for their analysis of all social, political and economic phenomena. In the second place, many of these Pink Tide critics base their analysis on an anti-systemic perspective, but fail to give significant weight to the progressive dimensions of the policies that have been implemented. Social programs that generate a sense of empowerment among the popular sectors, a nationalistic foreign policy, state takeover of industries in strategic sectors of the economy and participatory democracy are the key aspects. Freeman: You don’t have to be a Marxist to recognize the importance of economics. Isn’t the emphasis on economic factors a strong point in the analysis of these writers? Ellner: Not if the focus on the inability of Pink Tide countries to break out of the grip of the global economy means downplaying the importance of social and cultural changes. Some leading Marxists have envisioned change in a broader sense. Antonio Gramsci and Gorgy Lukács, for instance, defended the concepts of hegemony and totality whereby systemic transformation is a holistic process that occurs over a period of time, manifesting itself particularly on the cultural front. Writing in the same vein, the historian E.P. Thompson wrote of transformation as an accumulation of experiences encompassing century-long periods, sometimes replete with political setbacks. These views lend themselves to a positive evaluation of the Pink Tide governments based on a long-term perspective. Freeman: So you recognize that Pink Tide governments have had serious shortcomings but at the same time you point to positive aspects. What are they? Ellner: There are definitely pros and cons. In my opinion, the critics on the left have been accurate to a certain degree in their discussion of the cons, but have minimized or completely ignore the pros. The logical starting point for evaluating the Pink Tide governments’ advances and their long-term implications is the social programs. Neo-extractivism writers generally ignore the transformational importance of Pink Tide social programs, even while they recognize that their prioritization, and the state-centered strategy in general, represented a break with the neoliberal past. These same Pink Tide critics on the left as a rule fail to balance the criticism of social programs with recognition of their far-reaching merits. Specifically, the programs encourage a sense of efficacy, empowerment and participation among the nonprivileged, particularly the marginalized sectors of the population. At the same time, however, in the case of Venezuela, there have been an excess of free or heavily subsidized goods and services as well as bonuses which are not granted on the basis of productivity, education or other justifiable causes. So the social thrust of the government has its pluses and minuses. Another area with pluses which the Maduro critics pretty much ignore is the model of democratic participation, which was enshrined in the constitutions of Venezuela, Bolivia and Ecuador. Referendum and recall elections at the national level–a mechanism we don’t have in the United States–have been held in all three countries. In addition, mobilization as a strategy became especially significant in situations in which the government responded to the threats of regime change by calling on followers to take to the streets, rather than attempting to reach deals with political elites from above. Unfortunately, the government of Dilma Rousseff failed to employ this strategy at the time of her impeachment. Writers on both sides of the political spectrum have criticized the concentration of power in the hands of the national executive, a phenomenon referred to as “hyper-presidentialism.” In addition, in countries like Venezuela the governing political party is headed by congresspeople ministers, governors and the like. It thus lacks a semi-autonomous status vis-à-vis the state which would allow the party to serve as a check on misuse of government power, and especially corruption. Freeman: Are there other aspects with both positive and negative sides? Ellner: The neo-extractivism writers underestimate the extent to which Pink Tide countries modified past economic models rooted in the system of private enterprise. Pink Tide governments to varying degrees went beyond Keynesian-type regulatory measures by strengthening the state’s direct participation in strategic sectors of the economy. State control of strategic sectors has been a leftist banner in Latin America going way back in time. The private sector and political opposition staunchly opposed these measures (Exxon and ConocoPhillips pulled out of Venezuela and sued the nation in international court). Examples include measures that provided the state a controlling interest in Argentina’s oil company YPF and Venezuela’s oil industry along with the expropriation of the cement, electricity and steel industries and numerous other companies in that nation; the Ecuadorian government’s expropriation of 195 companies of the ISAIAS group due to their corrupt dealings; and steps assigning the state a major decision-making role in the hydrocarbon sector and other extractive industries in Bolivia. Subsequently, some state companies such as PDVSA were plagued by corruption. Nevertheless, just as the poor management and corruption of Mexico’s oil company PEMEX in no way detracted from the historical significance of the industry’s nationalization in 1938, the importance of these inroads stands on their own regardless of the Pink Tide’s failure to achieve acceptable levels of efficiency. Freeman: Any policies without downsides? Ellner: The nationalist thrust of the foreign policy of Pink Tide countries. In spite of their left-leaning sympathies, neo-extractivism writers tend to pass over these accomplishments. Pink Tide governments insisted on the incorporation of Cuba in the hemispheric community of nations, hardened the positions of their respective nations in favor of Argentina’s Falkland Islands claim, and supported initiatives that promoted Latin American unity and integration. As part of a reformulation of Middle East policy, Pink Tide governments established closer relations with Iran and assumed a more assertive pro-Palestinian position. The activist role of Pink Tide leaders, especially Chávez, Lula and the Kirchners in favor of Latin American unity and integration also has no downside, at least from a leftist perspective. 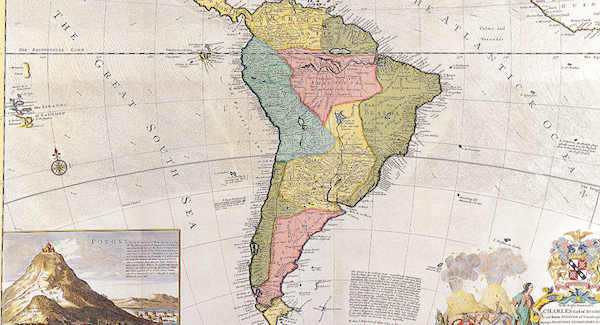 The goal was to establish a type of European Union for Latin America. Chávez was the first to point out at the Summit of the Americas in Quebec City in April 2001 (where he was the only Latin American leader to oppose the Free Trade Area of the Americas–the FTAA), that Latin America needed to achieve unity first after which it would be able to negotiate with the U.S. from a position of equality rather than weakness. Pink Tide leaders thus rejected “Pan Americanism”–which means unity taking in the U.S. and Canada–which historically has been a euphemism for U.S. hegemony in the hemisphere. Freeman: Given the direness of the economic situation, isn’t it understandable that many people would be anti-Maduro? Ellner: Perhaps so. But you need to place what is happening in context. A logical starting point is a look at the aggressiveness and hostility originating from opposition groups. Certainly, opposition to Pink Tide leaders was more intense than in normal times. In many cases opposition leaders represented a “disloyal opposition” in that by questioning the left’s democratic credentials they refused to recognize the government’s legitimacy, sometimes with the intention of achieving regime change at any cost. Furthermore, disinvestment by the private sector generated scarcities and unemployment. In the case of Ecuador, the radicalization of the opposition was backed by the financial fraction of the bourgeoisie, whose interests were particularly affected by Correa’s policies. The most extreme case was Venezuela where opposition to the Chavista governments nearly from the outset was unyielding and took diverse forms: business-supported general strikes–actually “lockouts” would be a more accurate term–that led to a coup in April 2002 and ongoing street violence in 2003, 2007, 2013, 2014 and 2017; non-recognition of electoral results in 2004, 2005, 2013, 2017 and 2018; an “economic war” which consisted of a general strike in 2002-2003, disinvestments and the decision by various U.S. multinational corporations to shut down operations in the nation; the diplomatic campaign against the Venezuelan government by Washington, the OAS and Mercosur; harsh economic sanctions imposed by the Trump administration and the threat of military intervention; and systematic condemnation by the local and foreign corporate media as well as the church hierarchy. Challenges of this nature pressured progressive governments into making concessions and carrying out certain policies that in the long run undermined economic and political stability as well as the achievement of stated goals. Specifically, the governments reacted by implementing pragmatic strategies to win over or neutralize members of the private sector and populist initiatives to meet the short-term needs of members of the popular sectors and rein in dissidents. These sets of policies in many Pink Tide countries, while politically successful in the short run, sometimes backfired in the form of corruption, the squandering of resources and economic sluggishness. Freeman: Isn’t there room for those defending distinct, even conflicting, positions within the solidarity movement? Ellner: The debate on the left over the Pink Tide’s pluses and minuses impacts the solidarity movement that opposes financial sanctions and foreign intervention, specifically in the case of Venezuela, Thus, for instance, the “plague on both your houses” position, which virtually denies that the government is any better than the right-wing opposition, detracts from the effectiveness of solidarity work in favor of Venezuela. Short of a military invasion of a foreign country, it is hard to rally people around a government whose performance is considered deplorable. In this sense, the Venezuelan situation is different from that of the Middle East where U.S. military involvement in the form of boots on the ground is in itself a powerful reason for U.S. citizens or those of any country to protest, regardless of their opinion of the Taliban, Saddam Hussein or Bashar al-Assad. But even in those cases, the absence of an iconic figure such as Ho Chi Minh, whose positive image strengthened the determination of many anti-war protesters, explains in part the weakness of the anti-war movement today in comparison to the 1960s. The examination of the specific features of Pink Tide governments thus has repercussions that go far beyond the classroom. The pluses of Pink Tide governments have to be factored into the equation. ↩ Andres Oppenheimer, “Capitalism in Latin America on rise despite leftist leaders.” Miami Herald, October 27, 2017. ↩ Pía Riggirozzi, and Diana Tussie, “The Rise of post-hegemonic regionalism in Latin America,” in Riggirozzi and Tussie (eds. ), The Rise of Post-hegemonic Regionalism: The Case of Latin America. Dordrecht, Netherlands: Springer, 2012, p. 10. ↩ Maristella Svampa, “Resource extractivism and alternatives: Latin American perspectives and development.” Journal Für Entwicklungspolitic 28, 2012, pp. 43-73. ↩ Steve Ellner, “Implications of Marxist State Theory and How they Play Out in Venezuela.” Historical Materialism 25, number 2, 2017. ↩ Steve Ellner, “Venezuela’s social-based democratic model: innovations and limitations.” Journal of Latin American Studies 43, number 3, 2011, pp. 421-422. ↩ Eduardo Gudynas, “Beyond varieties of development: disputes and alternatives.” Third World Quarterly 37, number 4, 2016, pp.722-724. Steve Ellner is Associate Managing Editor of Latin American Perspectives and a retired professor from the Universidad de Oriente in Venezuela where he taught economic history and political science from 1977 to 2003. Among his more than a dozen books on Latin American politics and history is his soon-to-be released Latin America’s Pink Tide: Breakthroughs and Shortcomings(Rowman & Littlefield). He is a frequent contributor to NACLA: Report on the Americas.